There was already something wonderfully weird and carnivalesque about Italian filmmaker Matteo Garrone's past films about the Naples mafiosi ('Gomorrah') and our modern yearning for celebrity ('Reality'). Now, the director has let his circus ringmaster's instinct flower with the bold, barmy 'Tale of Tales', a patchwork of three fantastical stories adapted from the fairytales of the seventeenth-century Neapolitan writer Giambattista Basile. Ogres, giant fleas, albino twins, an old woman flaying her skin in search of youth and a queen feasting on the heart of a sea monster: the sheer, obstinate oddness of 'Tale of Tales' sends crowd-pleasers like 'Game of Thrones' and 'The Hobbit' scuttling into the shadows of the forest in terror. This is not kids' stuff. This is scary, solemn and not just a little silly. Garrone presents these stories exactly as they come – by inviting us into their world rather than the other way round. What links these strange, seductive tales is a cheeky observation of the follies of power. One king (Toby Jones) breeds a flea and accidentally marries off his daughter (Bebe Cave) to a brute; another (Vincent Cassel) allows his rampant sexual desire to lead him into bed with an old crone (Hayley Carmichael); yet another (John C Reilly) dies after taking the advice of a mysterious old man on how to cure the inability of his wife (Salma Hayek) to have a child. The design, costumes, photography and effects all combine to create a medieval world that feels mythical but not overly fantastical. The reverential tone and slow pace take some warming to, but there's much to delight as 'Tale of Tales' takes hold – not least Garrone's belief in the power of these stories to travel through the years. Where we sometimes see the cracks is via a niggling sense of this being a global pudding when it comes to the casting. American actor John C Reilly is a little obtrusive, while Frenchman Vincent Cassel hams it up. Others, though, are perfectly suited to this world: British actress Shirley Henderson manages to communicate the desperation of an old woman craving youth even from behind heavy make-up, while Toby Jones's comic timing and physicality are perfect for his role as a deluded king, father and flea-obsessive. 'Tale of Tales' might lack magic in the immediate, flashy sense, but its strange spell is altogether seductive and special. 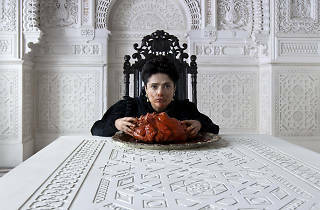 A film like Tale of tales comes as a very refreshing watch after the cheesy, over-packed episodes of Game of Thrones and the overjoyed, fluffy monstrosity that the Hobbit, sadly, became. Remember when you first discovered the original versions of the Grimm tales? That Sleeping Beauty got pregnant whilst asleep? That the ugly stepsisters cut their toes off and lose their eyes by the end of the story? If you're into that, you will be even more into this beautifully written film, which brings you just this and more. It takes a down-to-Earth approach to fairy tales, and brings them as close to reality as possible, while losing nothing of its hypnotic charm. Little discussion and great photography are key characteristics here, but the actors, with only a few misfits, carry this film. They're all silent, they're all strange, and they're all bizarre in one way or another. You won't like anyone. You won't root for the right people. And you won't be able to look away. 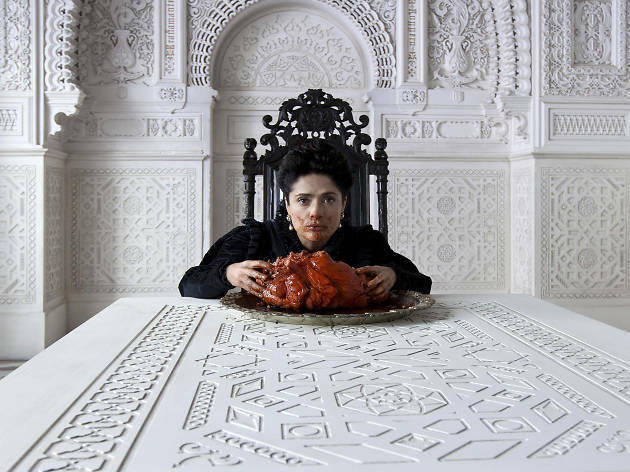 Tale of tales takes everything literally, and hides none of the detail. If the princess is forced into marriage, let's tell it all. If the king has desires, show it the way it is. It is a captivating, brutal watch that will linger for days, but in the best possible way. I love my fairytales and some of the best ones are based on Basile's stories, but I have to admit I did not have any expectations when watching the movie. It was full of surprises - the costumes and settings were stunning - the dialogs cut to a minimum, which helped creating your own storyline, the actors well chosen and it did not lack of "wow - wait - what?" moments. I would not recommend it to everyone - if you are a fan of Game of Thrones and mystical adventures - it is a most see, if you are a fan of cinematic art: yes, definitely, but if you rather continue living in Grimm's world of fairytales: think about it again. It is definitely one of a kind. Pace is overly slow, dialogue is kept to a minimum and the baroque costumes and décor incredibly over the top, so it does take some time to get used to. However, it has an irresistibly bewitching and enigmatically captivating effect on you. Narrating harsh, sometimes gruesome, always sad, stories about the follies of power, those tales are grown-up and inspect the cruel realities of the human heart and human nature. Films like this one are a rarity, so do watch it while you can! A stunning work of cinema. The composition, design & style of the film move Matteo Garrone into the league of the great Italian Directors. It has the wide screen sweep of Sergio Leone's magnificent Italian Westerns , and can be respectfully compared with the wide screen masterpieces of Visconti, and Fellini. Matteo Garrone has made the film in English, and selected a very watchable, and interesting international cast which includes Toby Jones & Salma Hayek. I bloody loved this film. It has everything I love in one place- fairytale s (the dark kind), kings & queens, tricks & spells, deals & plots, oaths & secrets, love & betrayal and tales of the unexpected. It’s all told so well, with so much love and care, with everything looking absolutely gorgeous. There’s so much for you to see – so much of which is unexpected, some of which is slightly scary, and all of which is a true pleasure to watch. It’s a feast for the eyes, the brain and the heart. The performances are all solid and utterly believable. There’s depth within each character, a reason and motivation rooted in their decisions. The costumes are jaw-dropping, the monsters Kafkaesque, the settings breath-taking, the soundtrack haunting yet never overwhelming and the performances totally memorable. Films like this don’t come around very often so see it whilst you can!